New Office Phone Numbers at Texas A&M AgriLife Extension Service!!! In the first pic above , you can see that the marigolds, ‘Cheers’ cabbage, ‘Snow Crown’ cauliflower, and ‘Sweet Slice’ cucumber look great. The second pic shows the ‘Provider’ bush beans growing equally well. 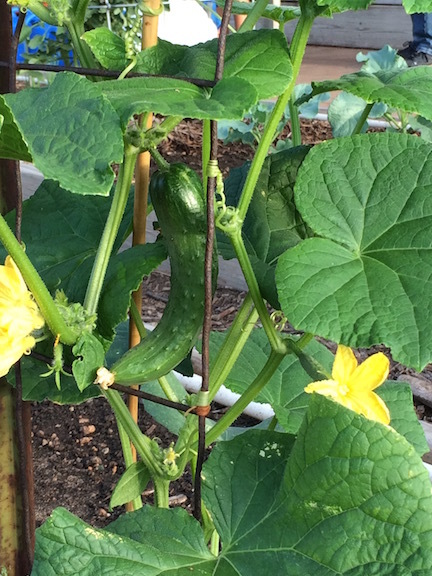 The first picture below shows one of the cucumbers that was harvested…a bit larger than pickling size and just fine to pick. Picking ripe fruit regularly encourages the plant to produce more. 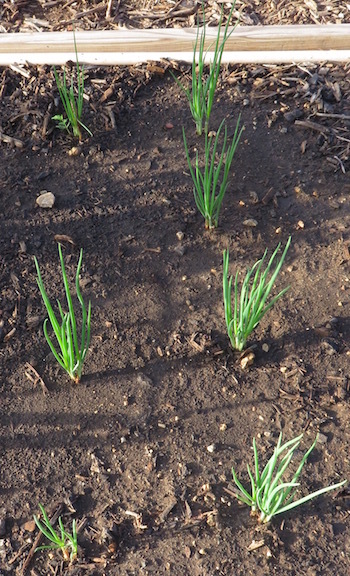 The next picture is a group of bunching onions. If you remember, we planted two rows with 4 groups of 2 bulbs in each row. In the onion picture below, you can see that one of the bunches did not come up in the row on the left. What we did was pick the largest group of two and carefully separated the two bulbs and moved one to the empty spot. Quick quiz….onions are a …fruit or vegetable? Vegetable—you are mainly eating the greens and the white stem. 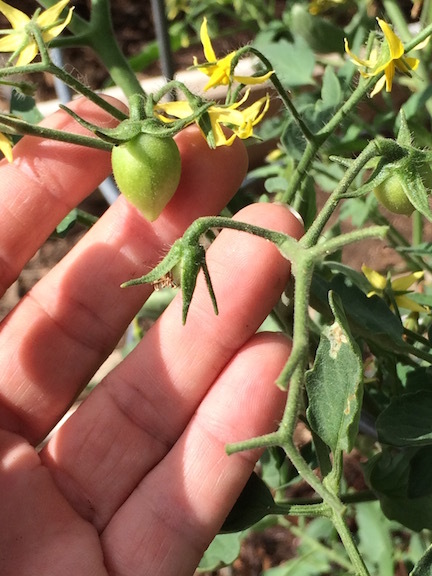 Let’s have a look at our young tomatoes….we have tons of flowers so I’m hoping for another great tomato harvest. 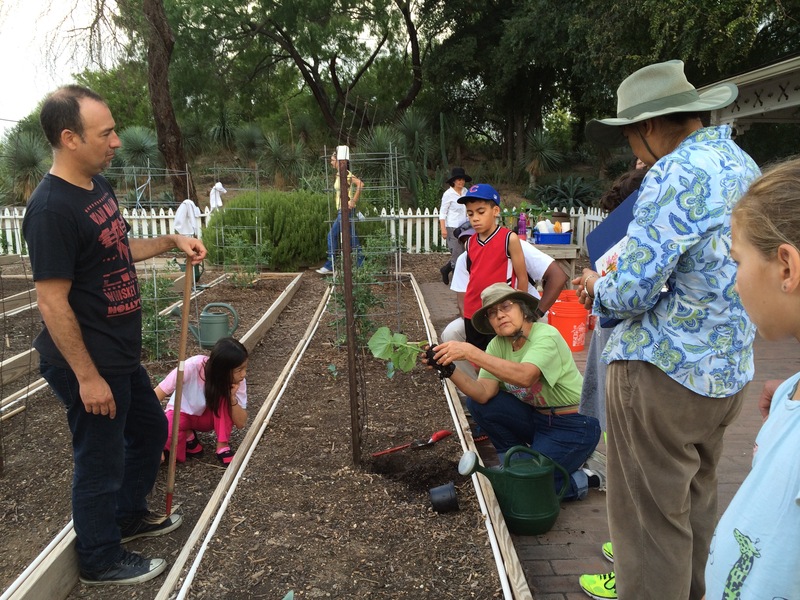 Each of our gardeners planted 7 ‘Kolibri’ Purple Kohlrabi. We also planted some seeds—20 ‘Babybeet’ beets and 20 ‘Santo’ cilantro. Pictures of planted seeds (bare ground) are not especially interesting, but I’ll have some pics of sprouted seeds next time. As we’ve talked about in the past, it’s important not to plant the seeds too deeply. Let’s have a look at our garden as we left it for the day…it’s neat to see how it changes from week to week. For our extra pic of the week: a pinwheel! 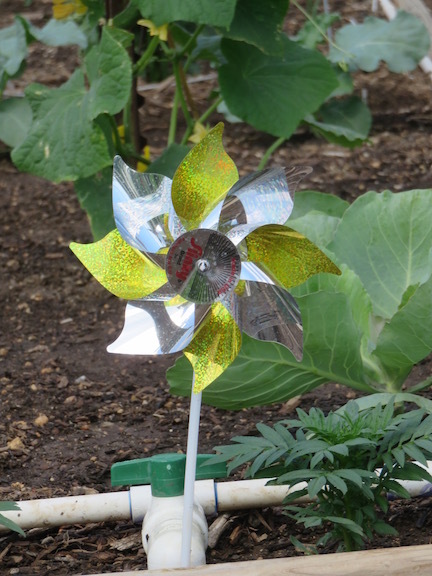 Consider using pinwheels as inexpensive and useful decorations for your vegetable garden. We have one at the end of each garden bed in our section so we know where our section starts and ends. Also, the movement and sparkle of the shiny pinwheels in the breeze may be a deterrent for birds and other pests…give it a try! 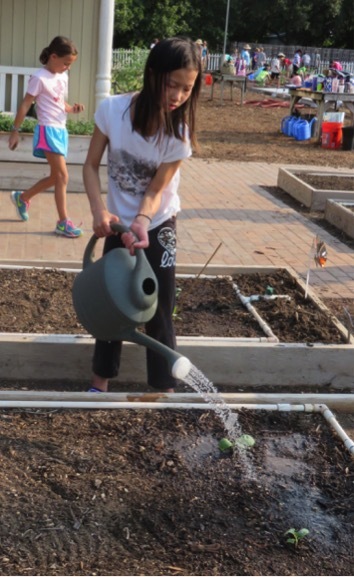 Welcome to Week 4 at the Children’s Vegetable Garden. We planted 2 ‘Snow Crown’ cauliflowers, 4 Orange Tishean marigolds/mari-mums and 4 ‘Dreamland’ mixed colored zinnias transplants today. But first, we did our daily chores. 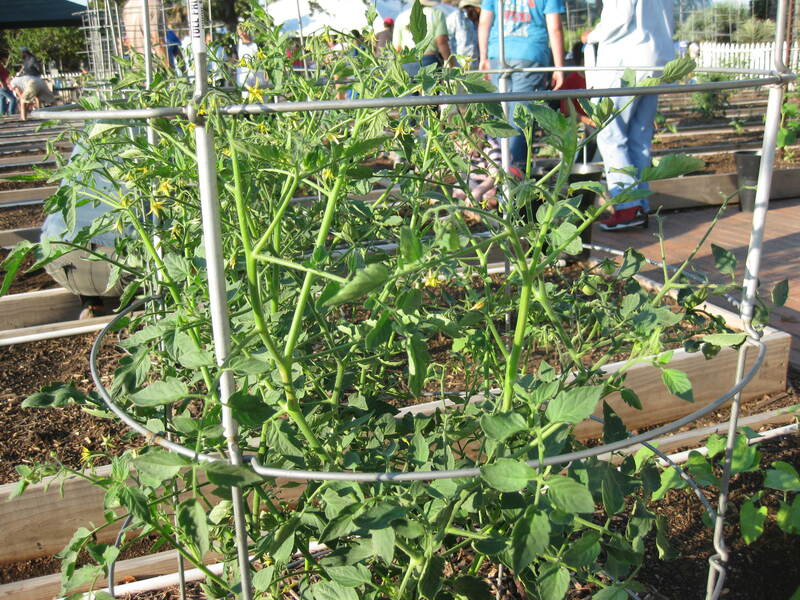 Tomato Plants- Push in any branches of the Tomato Plant into the cage to help give that support to the plant as it grows. Be sure to clip of any leaves that are touching the soil. 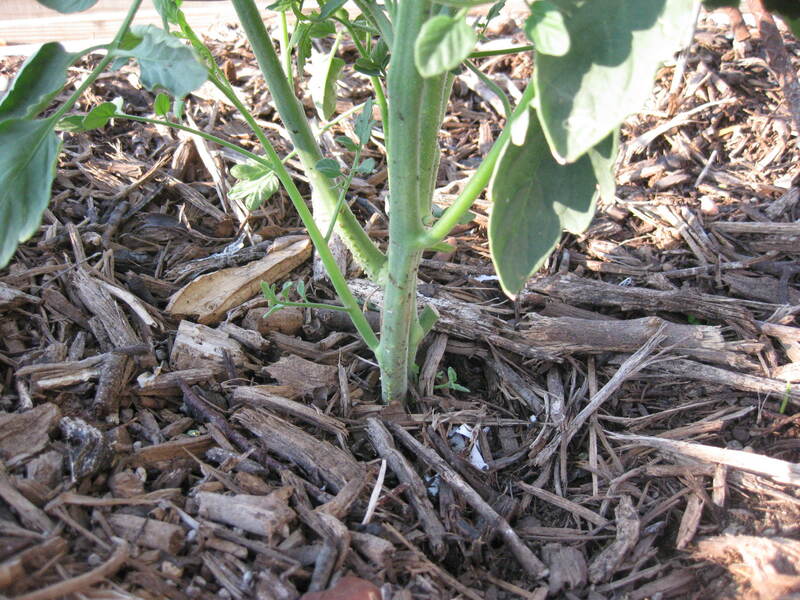 If the leaves remain on the soil, they can potentially pick up diseases which will hurt the plant in the long run. 2. 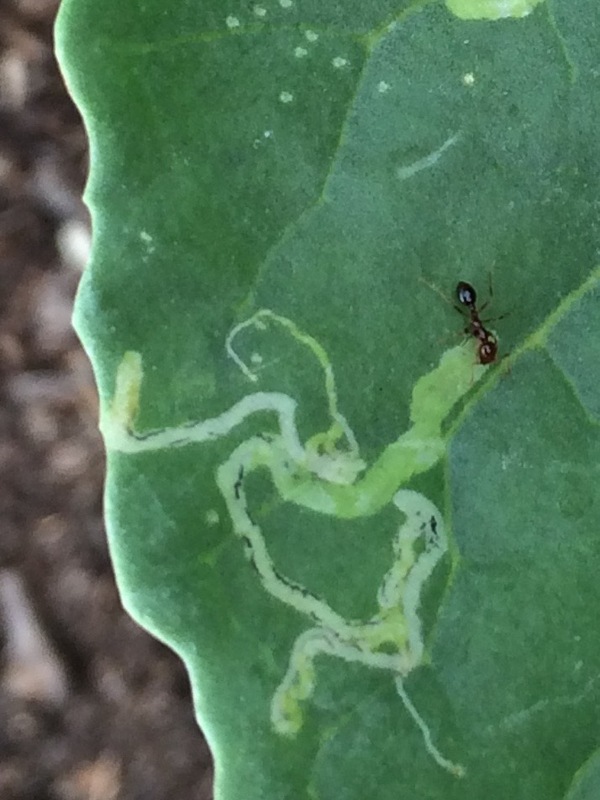 Insect Patrol- Look around your cabbage and broccoli. If you see any cabbage loopers or eggs, gently smash them by rubbing your thumb across them. 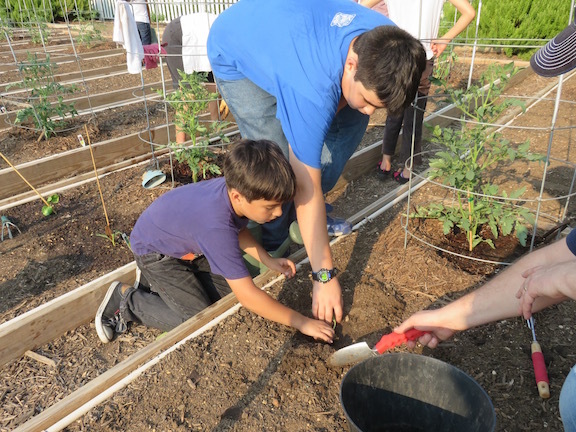 Now to start, the kids scratched up the soil to the areas where no plants have been planted yet to get it ready for the cauliflower transplant. Then we measured out the area where the cauliflower would go. We used the irrigation on/off valve as a guideline. 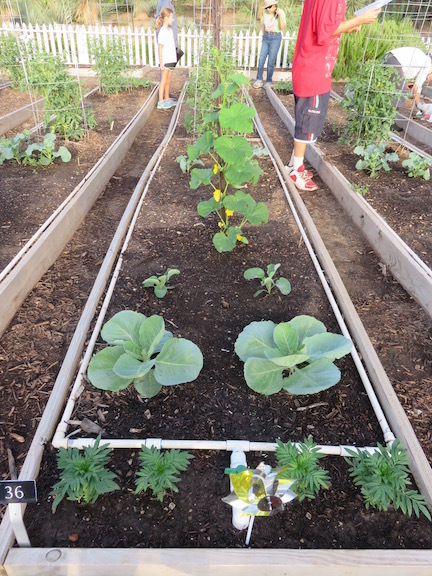 We measured 20” away from the inside center of the cabbage plants toward the cucumber trellis and spaced our plants 14 inches away from the top and bottom of the inside part of the plot as well as 12 -14 inches from each other as to be lined up with the cabbage plants. We were sure to thoroughly soak the 6 packs until all the air bubbles were removed before removing the transplants from the tray. With this heat, it’s best to re-implement this old technique. Then we planted them( peat pot and all) a little below the soil line, as deep as the first set of leaves. 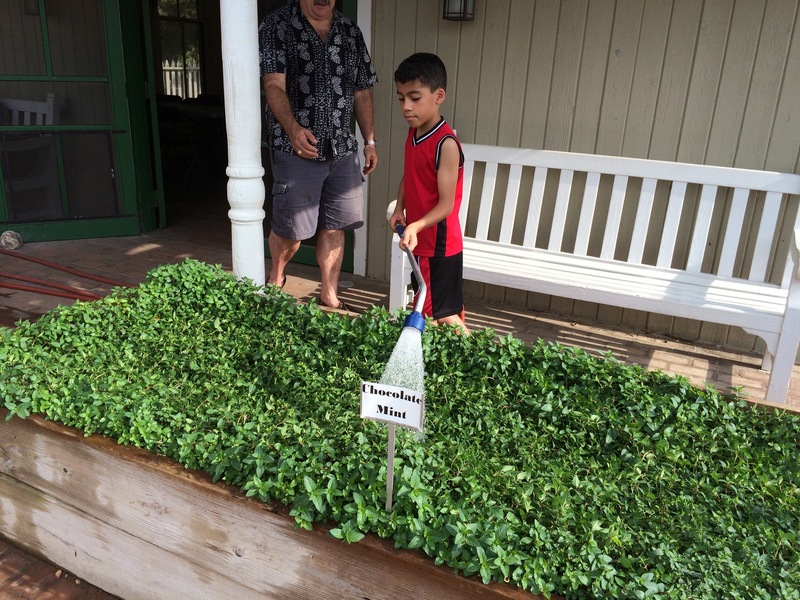 We finished this process by hand watering the plants in a couple of times and labeled our plants with ONE plant tag. On to the Marigolds! We planted them evenly spaced and planted on each side of the irrigation line and about 4 inches away from the top and bottom of the plot. Check out this pic of the Marigolds. We notice some adventitious roots growing and so we planted them deeper than the soil line to help promote the root growth. We followed the same procedures as we did with the marigolds. 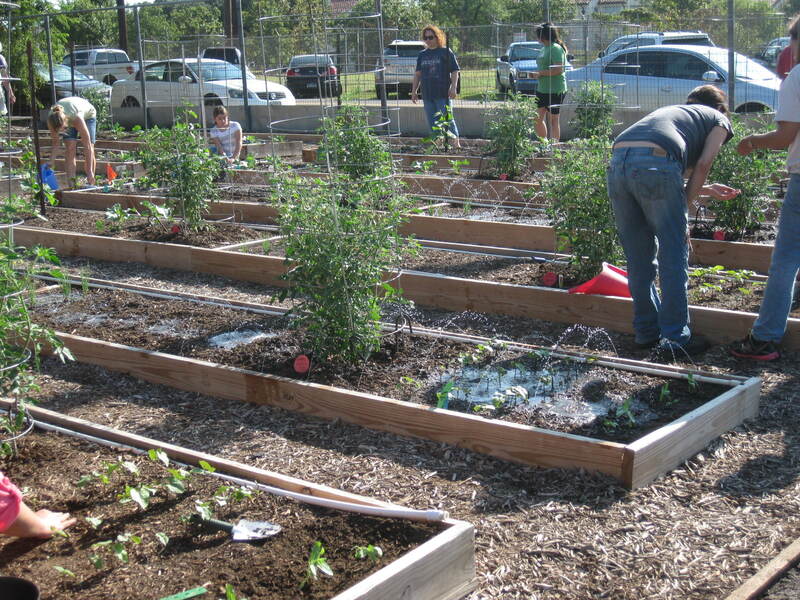 But do not plant them deeper,just level with the soil line. 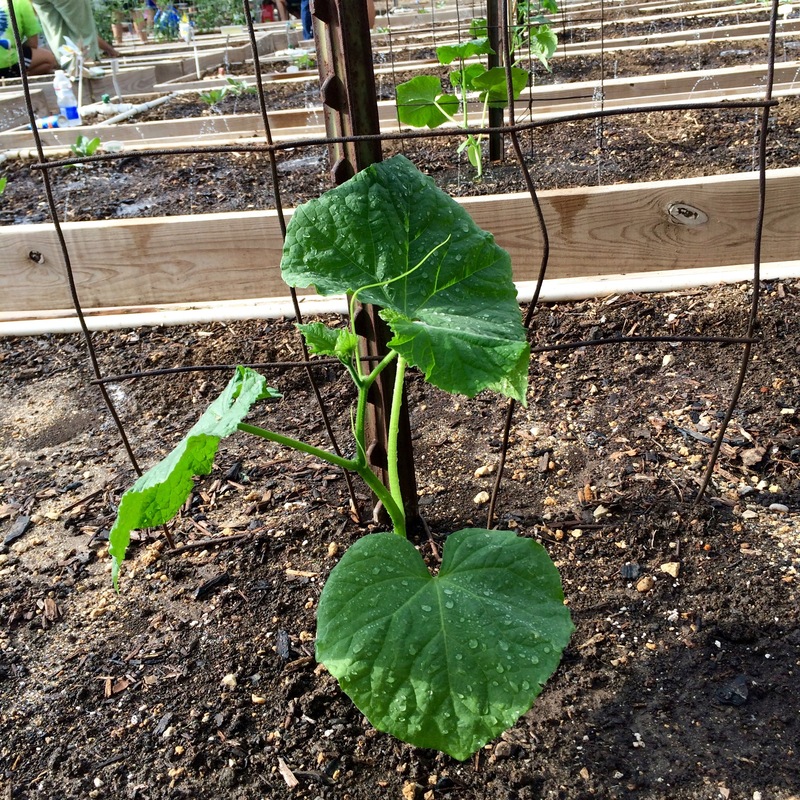 They were planted at the very backside of the plot and starting 6-8 Inches in from inside board. Next we watered for 10 to 15 minutes and then fertilized with Hasta Gro on all new transplants and old. 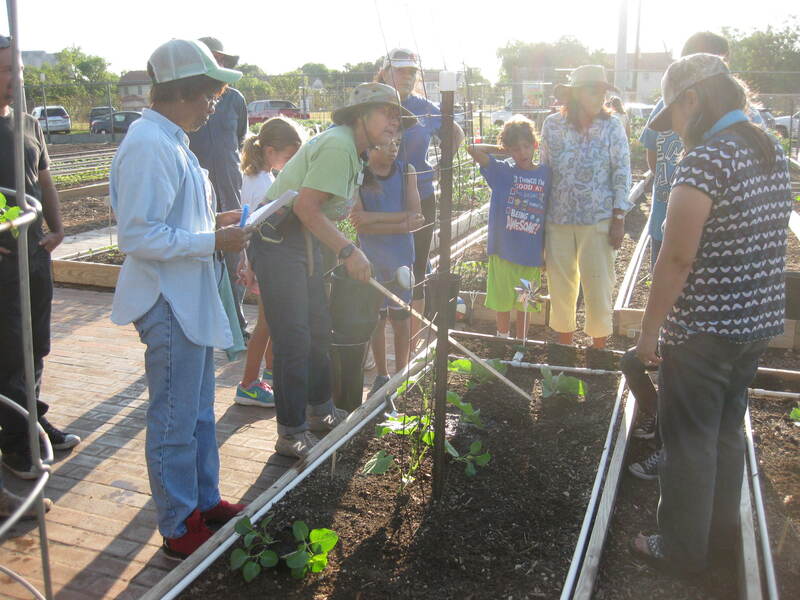 For our Junior Master Gardener Class, we did a Fertilizer Rap and had a small discussion on Robins and their Life Cycle. We even put out a small fruit cup for the Robins to munch on later. As usual, we started with our normal maintenance tasks and then we continued our planting this week with a ‘Sweet Slice’ Cucumber transplant and ‘Provider’ Bush Bean seeds. We postponed planting the cauliflower until next week because they were still a bit too small. 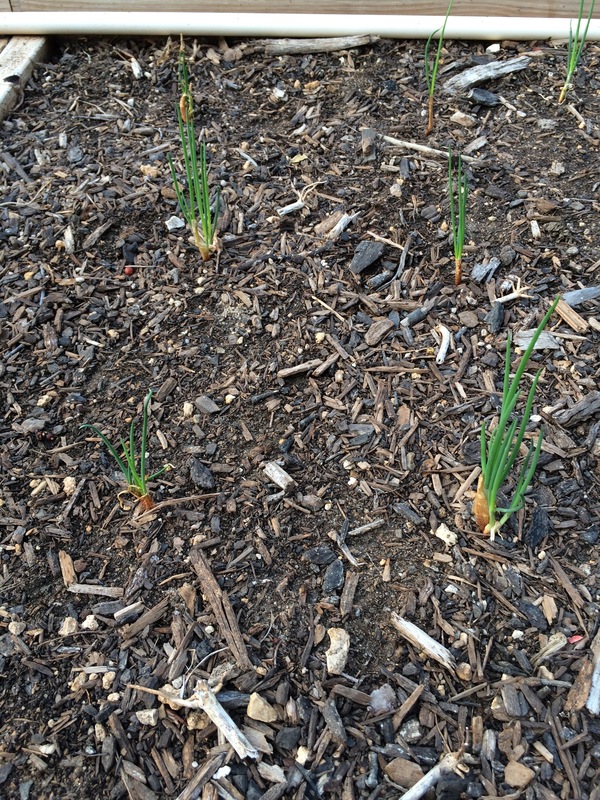 But before I talk about the new plantings, I’d like to do a little shout out to the bunching onions we planted last week…don’t they look great! 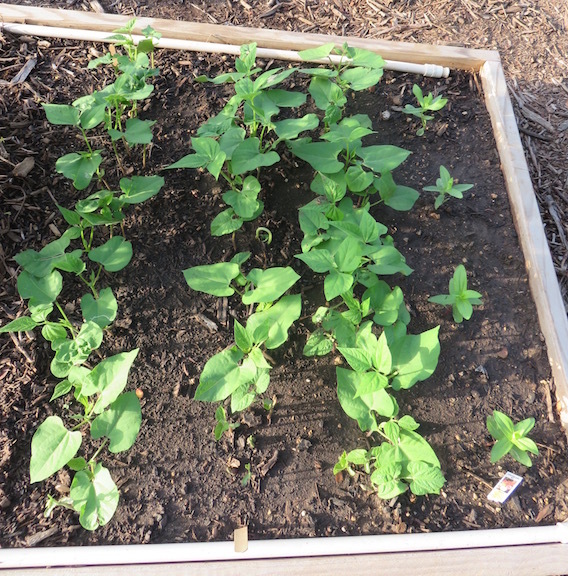 The bush green beans are the first seeds we have planted this season…up to now we have planted transplants or bulblets. Seeds are easy to grow as long as you remember that depth and spacing is important. For seeds to sprout properly they should not be planted too deep (and this is a common mistake.) If they are planted too close together they will not have enough space. (We’ve discussed the issues with light and disease caused by too-close spacing in a previous post.) Your seed packets (or our agenda, if you are following along with us) will have planting information. 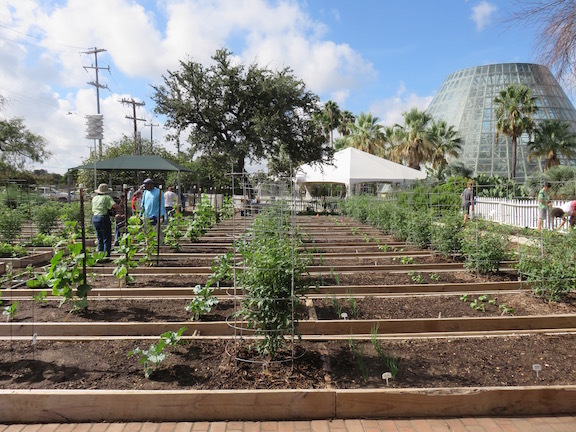 When we planted our beans, we wet our soil, then measured and laid out a row, pushed the seed down about ½ inch, covered them, and watered them in. We repeated this for 3 rows of beans. Laying out all the seeds a row at a time means you don’t have to wonder what seed you were in the process of planting when you got distracted by a phone, bird, etc. In addition to maintaining our individual plots, there are some plots at the CVG that contain just one kind of plant. Some of these are experiments, to see how a certain plant grows. Other sare demonstration plots. As part of our chores, we help maintain these. 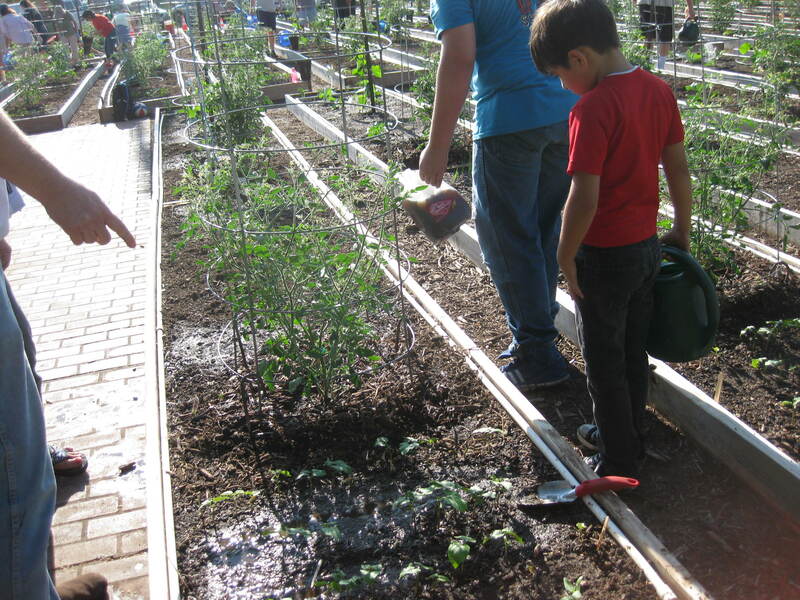 After finishing with his plot, one of our gardeners helped by watering the chocolate mint. You can click on the picture if you’d like to see a larger version. 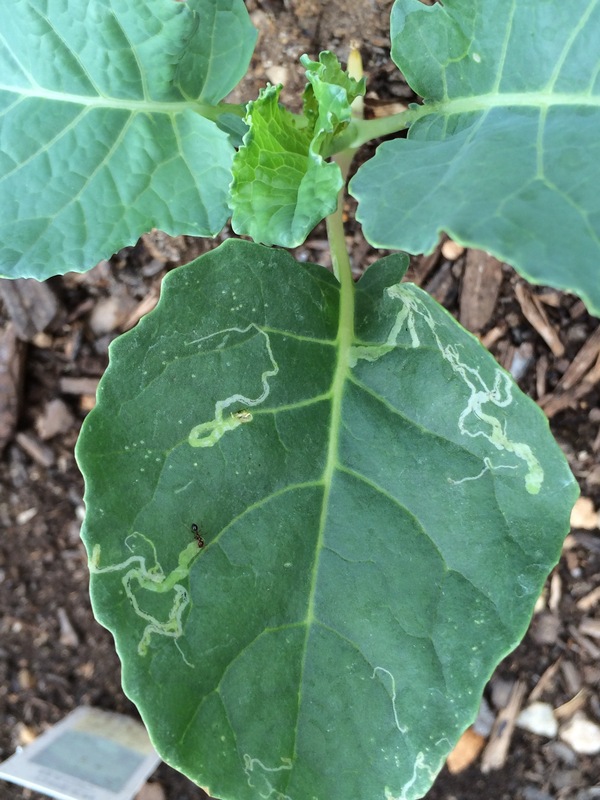 These trails are caused by leaf miner larvae tunneling inside the leaf. Usually, you don’t need to treat them unless there are a lot of them. And, of course, if it were a crop you were growing for edible leaves, they would not be very appetizing looking. So, we’ll keep an eye on them, but do nothing about it this week. 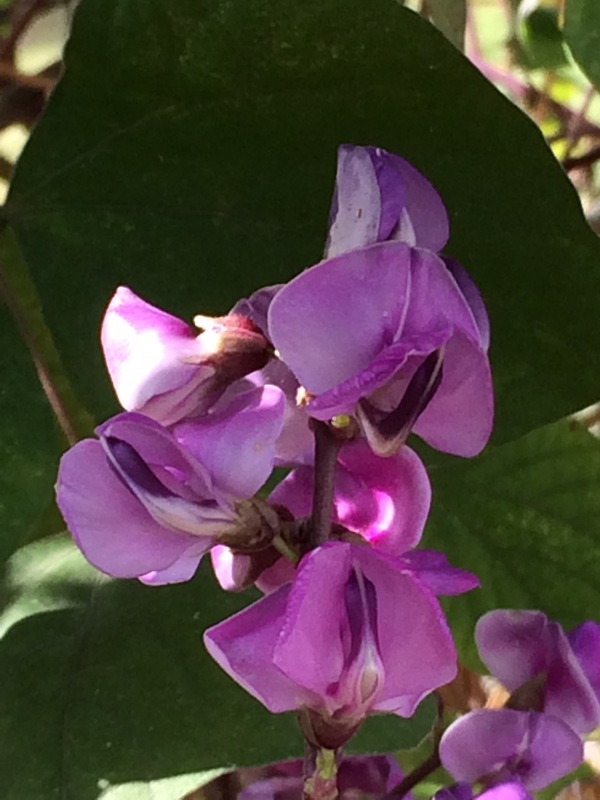 This is a beautiful vine with lovely purple-pink flowers and beans, great on a fence or on a trellis. I tend to treat it as an ornamental. The flowers attract bees and butterflies; in fact, there were several bees sharing the space with me when I was photographing the flowers. It’s definitely worth considering in your garden. 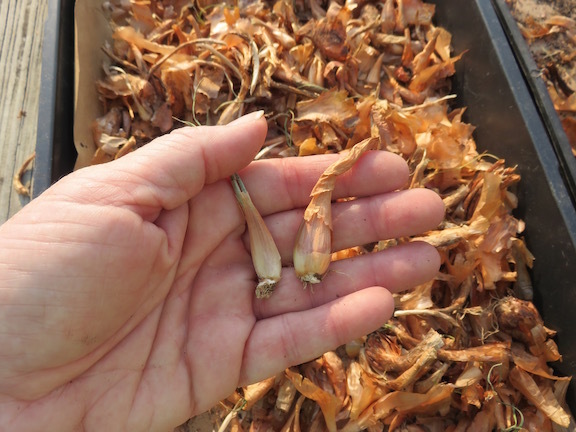 Seed can be easily collected from this annual vine when they are dry to save for next year’s garden. 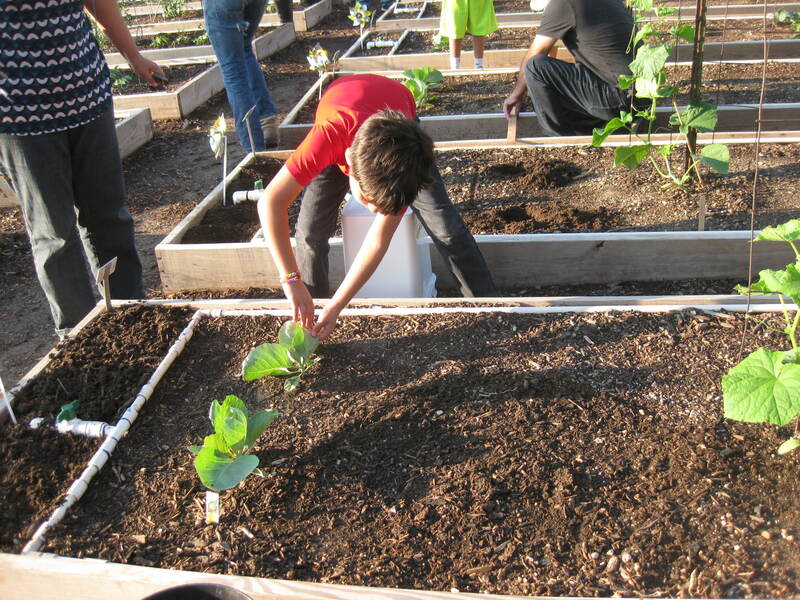 The first few weeks of the CVG we are planting, planting, planting. 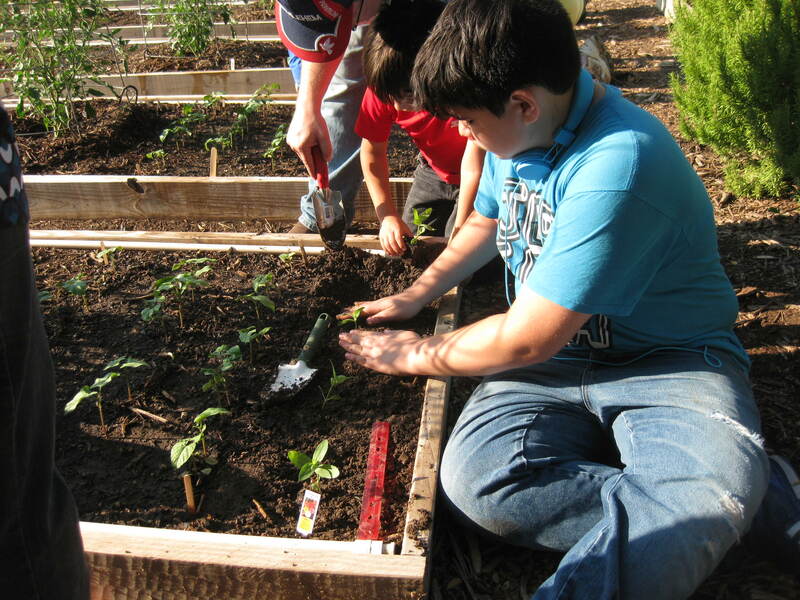 This week we planted broccoli, cabbage, and onions. 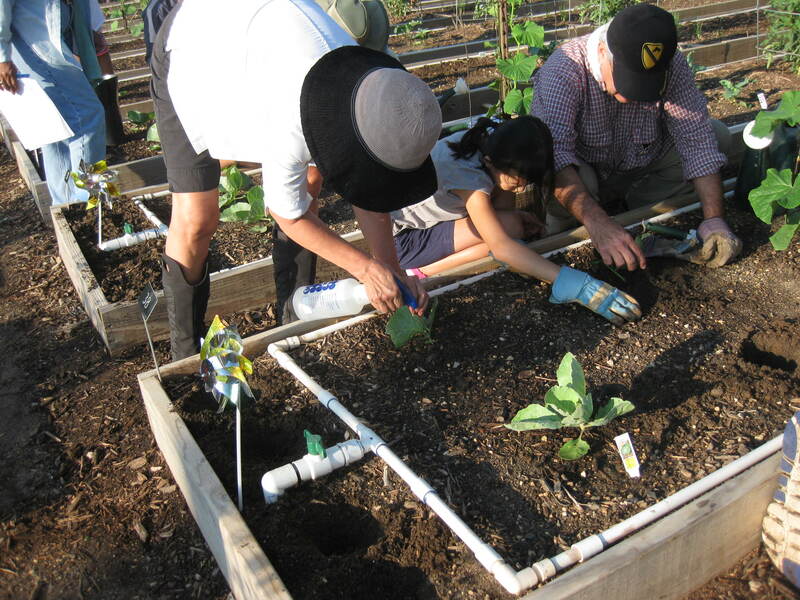 But first–you will be able to repeat this in your sleep by the end of the season!–we weeded and looked over our plants. 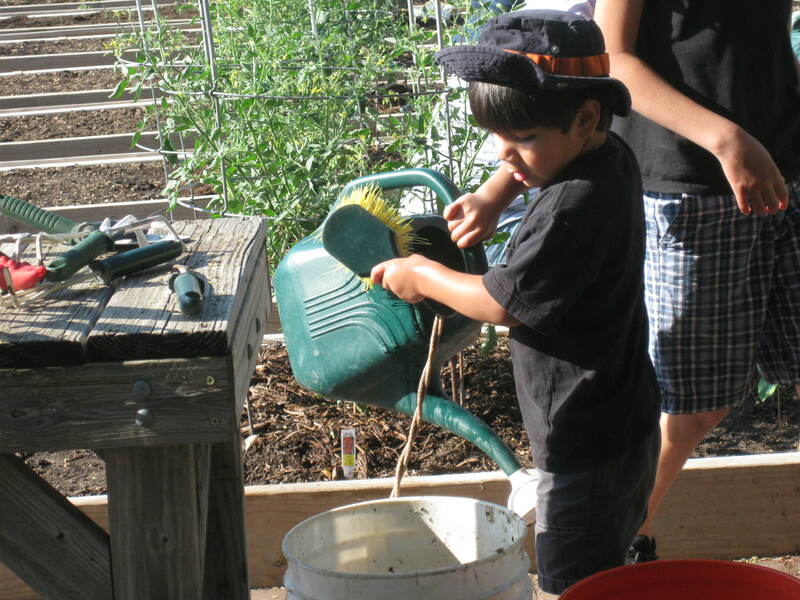 We didn’t really have many weeds or bugs to speak of so far, so we went on to fertilizing. Once again, the agenda for the CVG Week 2 is posted separately on this blog, so I will only touch on the highlights or interesting things. We spread 4 cups of the Ladybug granular fertilizer on the bed, and scratched it in lightly. 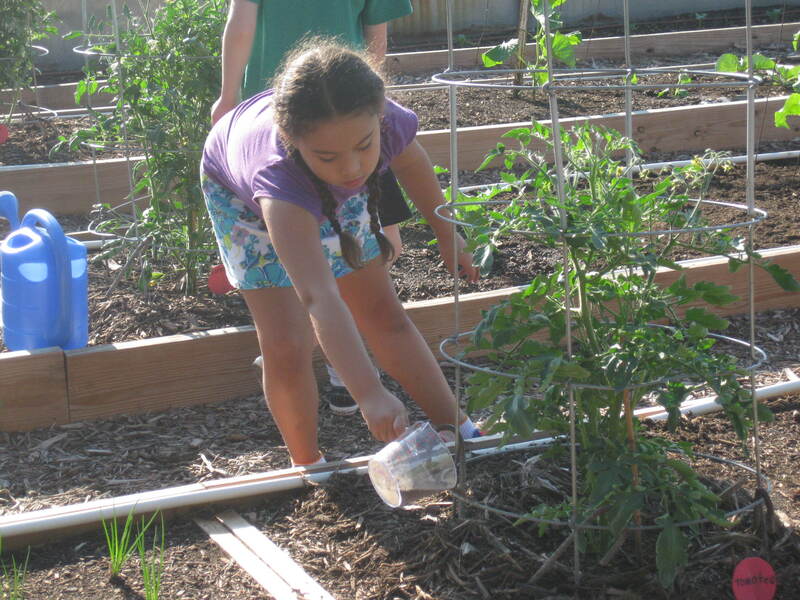 Then it was time to plant our tomatoes. 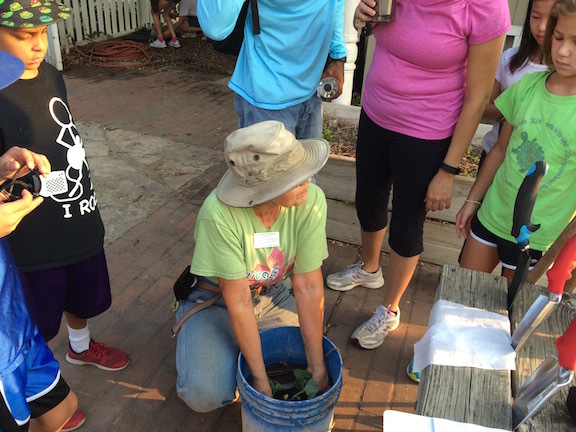 Before we got planting, Sandra demonstrated a great pre-planting tip. 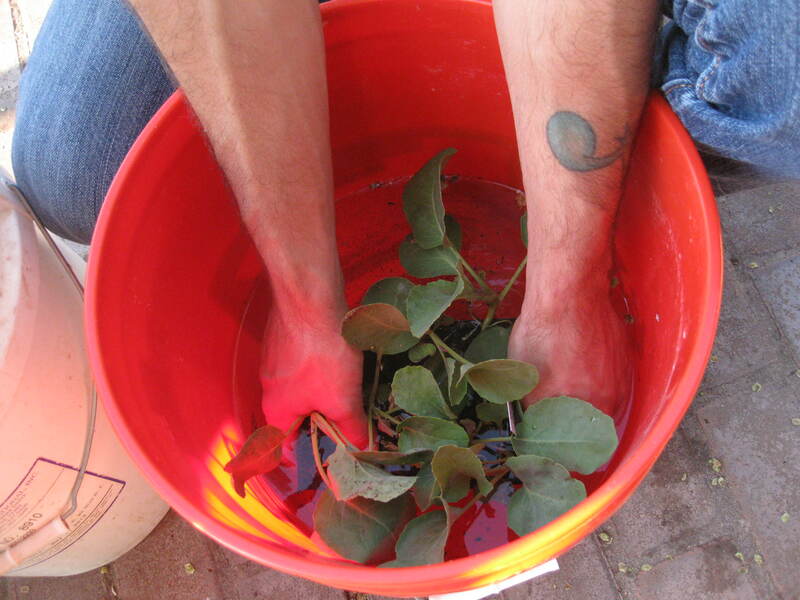 When you buy six-packs of plants, the soil may be dry, or starting to dry out, and she recommends a brief soak until the air pockets are gone. 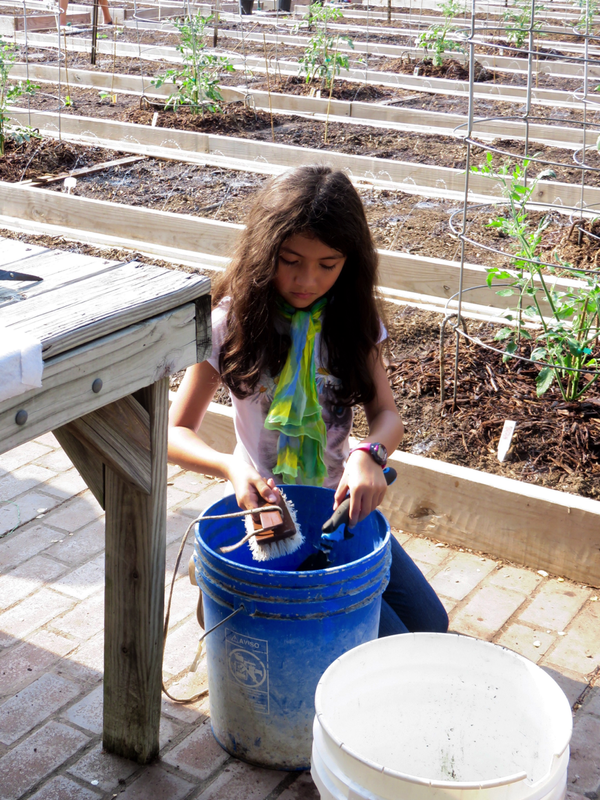 In the pic below, she is holding a six pack (of cabbages) in a bucket of water, with the soil submerged just below the water level, until the bubbles stop. 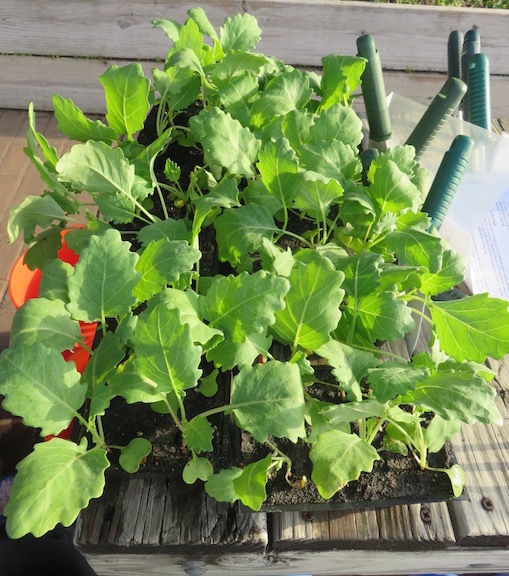 Then we went on to plant 2 cabbage and 2 broccoli transplants. 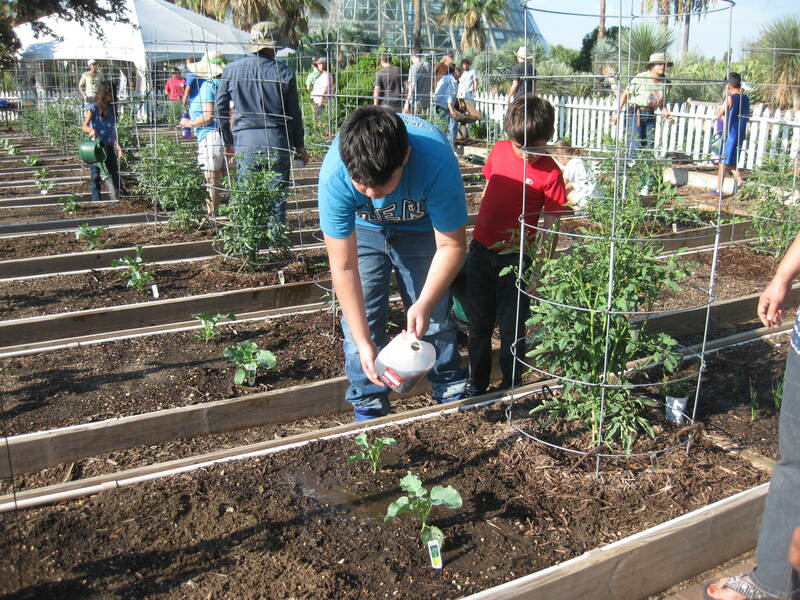 Spacing plants properly is important for healthy plants and a good harvest. 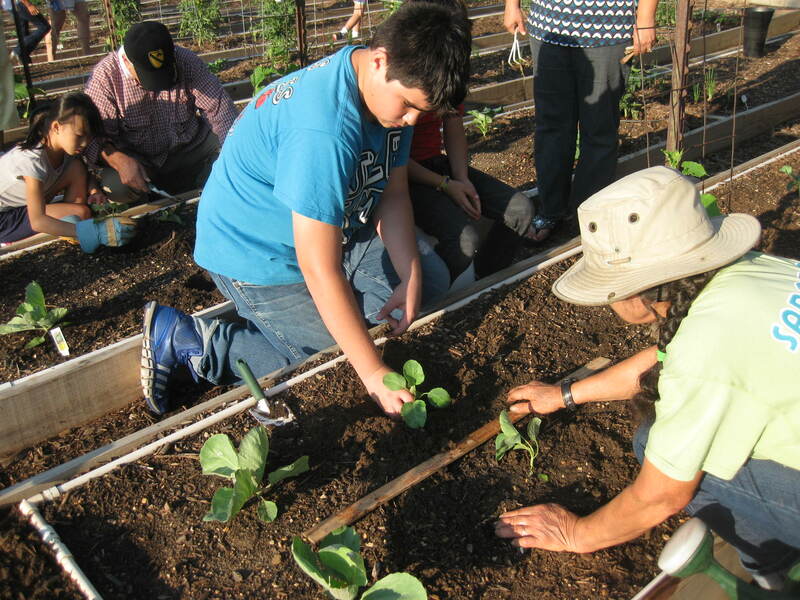 The current agenda gives the spacing instructions for these plants, and in the picture below you can see Steven demonstrating how to measure accurately to plant the ‘Cheers’ cabbage. 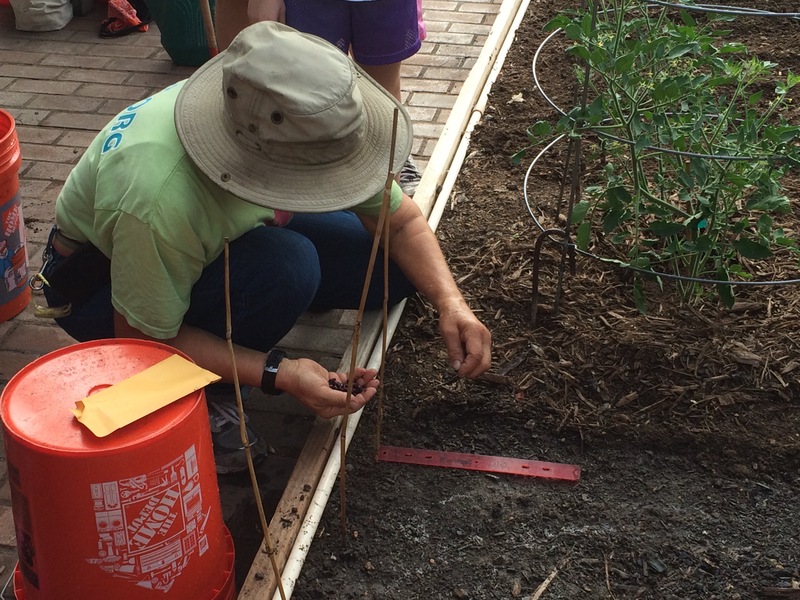 Inexpensive yardsticks and plastic rules are great tools for spacing plants. Yay, gardener teamwork!!!!! 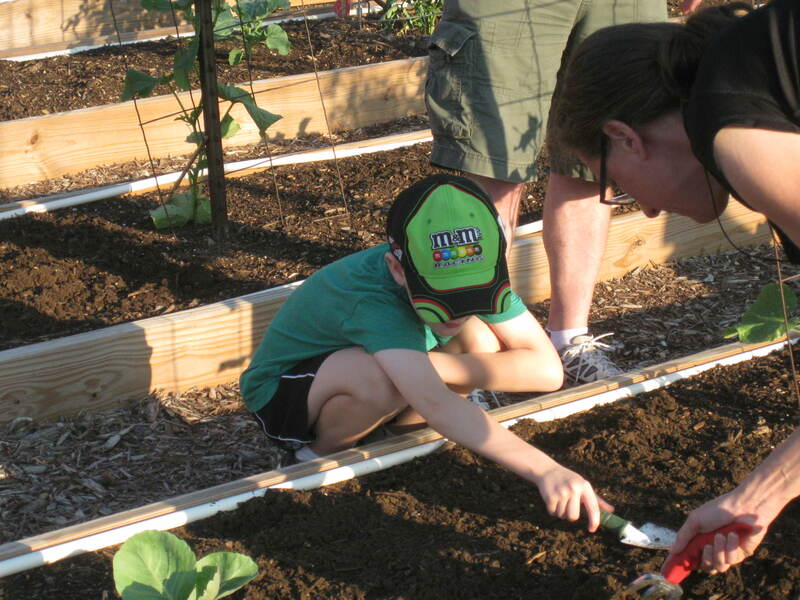 These gardeners are carefully planting their ‘Green Magic’ broccoli. Our final planting today was multiplying onions. These were picked in the spring, from one of our own perimeter beds at the CVG. Here’s what they look like. 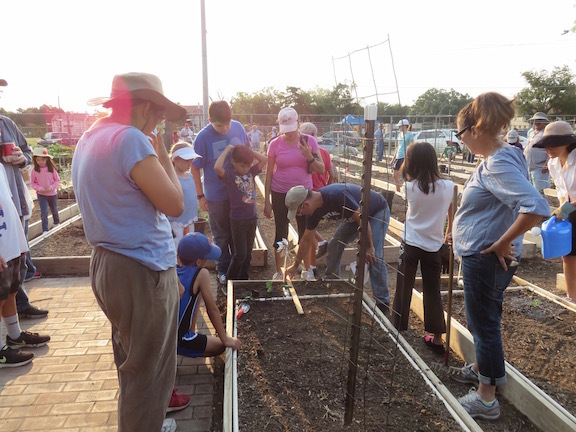 Each of our gardeners planted 16 onions in pairs. Our wrap-up activities this time included some hand watering, checking the irrigation system, and cleaning our tools. In the first picture, our gardener is fertilizing the plants with 2 oz of HastaGrow to 1 gallon of water. In the second, another of our gardeners is washing her tools. Cleaning your tools after each use helps reduce the spread of disease AND helps your tools last longer. An inexpensive scrub brush is great at getting dirt off the tools. 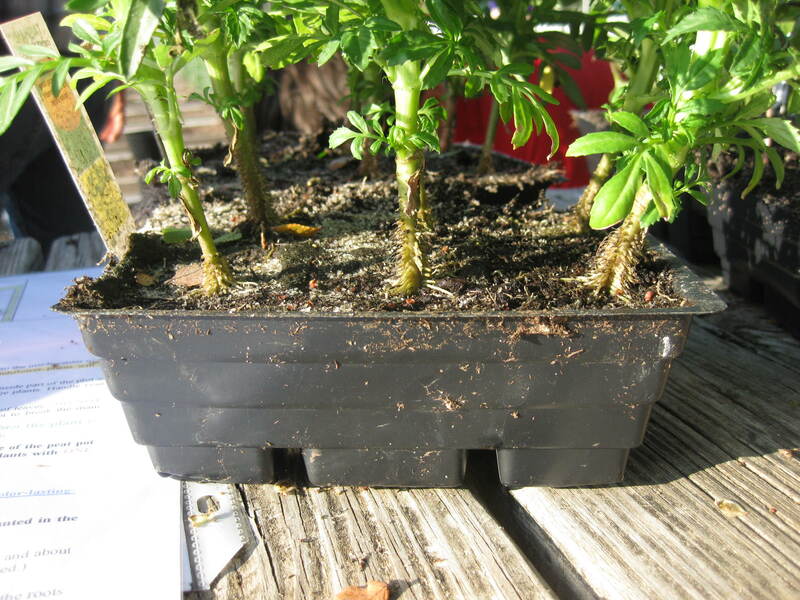 Be careful when working around your plants that you don’t accidentally scrape the stem. 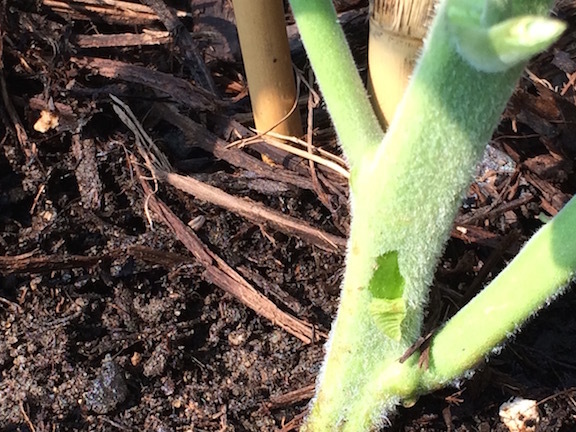 This tomato plant was scraped and the open wound is an entry point for diseases. 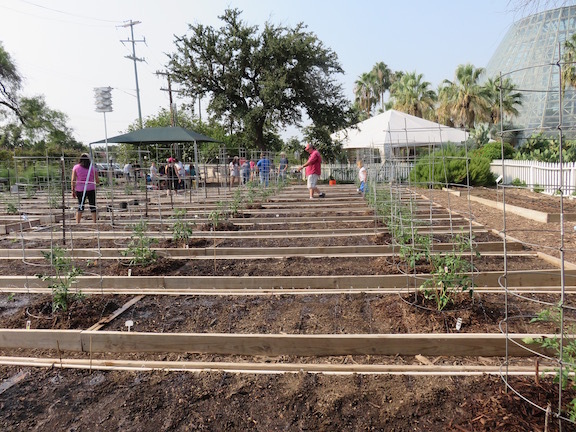 Our garden section at the end of the day… tomatoes growing, onions planted to the right of the leftmost tomatoes, and cabbage/broccoli way on the left but too small to make out in this pic. This week’s extra picture is… well, can you guess? 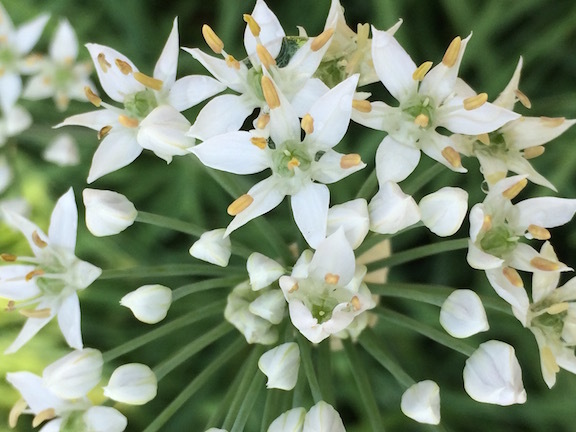 I won’t keep you wondering…garlic chives inflorescence. (OK, I snuck a fancy botanical term in there, and I’ll wimp out and let wikipedia define (and other related terms) if you are interested.) 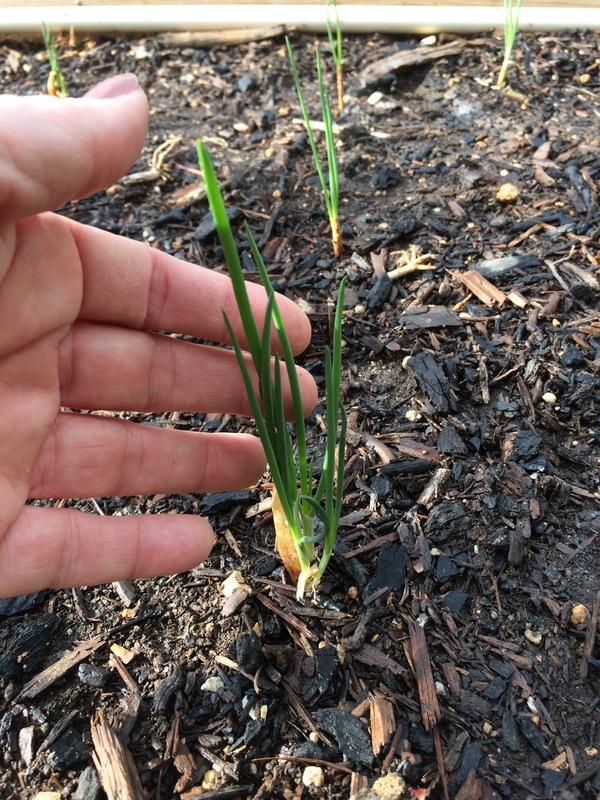 Let some of your garlic chives bloom and set seed, and the seeds can be gathered or you can let them drop off and reseed.